My Little Pony: The Movie – Canterlot and Seaquestria Castle - Frugal Mom Eh! The first annual Friendship Festival in Canterlot is off to a stormy start! Chaos ensues when Tempest Shadow arrives, crashing the party on behalf of the menacing Storm King who plans to steal the ponies’ magic and rule over Equestria. In My Little Pony: The Movie, Twilight Sparkle, Rainbow Dash, Pinkie Pie, Rarity, Fluttershy, and Applejack travel on an unforgettable journey beyond Equestria to save their home and all their pony friends who live there. While seeking help and running from Tempest Shadow, the pony friends face big friendship challenges and meet new characters who test their trust but always find a friend in the end in them! There’s a swift-talking and trickster cat, Capper Dapperpaws; Captain Celaeno and her crew of swashbuckling pirates on a magical skiff; and the kingdom of Queen Novo nestled deep undersea where seaponies with a secret are seeking refuge from the Storm King. 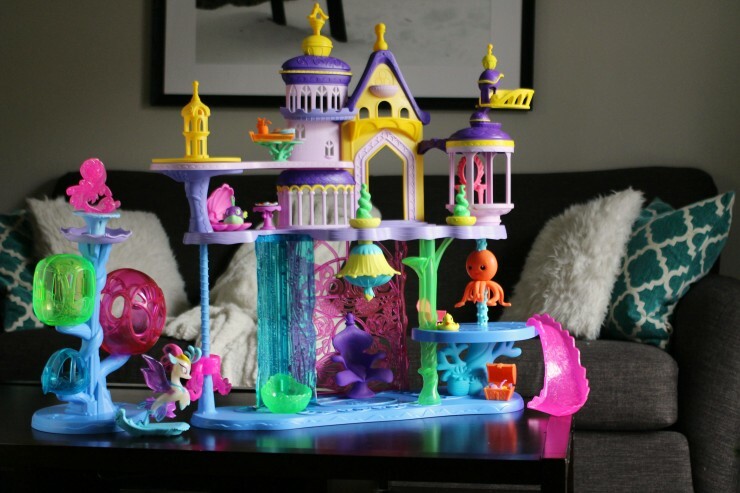 Kids can imagine adventures from My Little Pony: The Movie with the Queen Novo and Spike the Pufferfish figures that are included in this 2-worlds-in-1 playset. 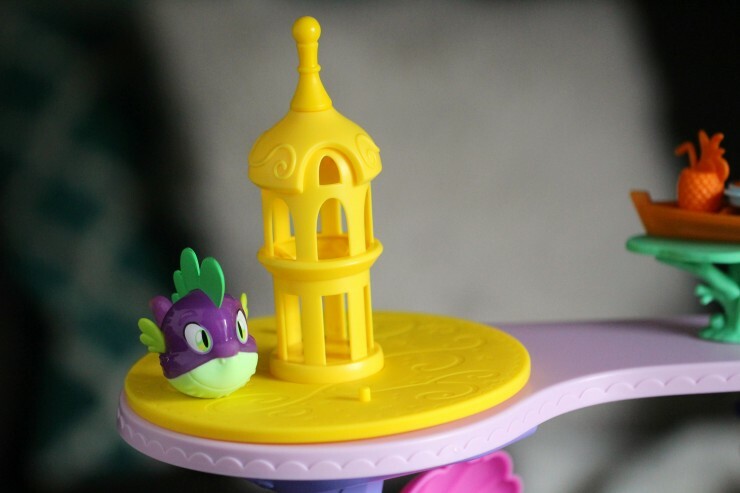 The first floor of the castle represents Canterlot with fun features like balconies and a dancefloor, while the bottom features undersea fun from the kingdom of Seaquestria! Included with this playset are over 30 accessories for bedtime, beach time, tea time, and more including a vanity, throne and waveboard. 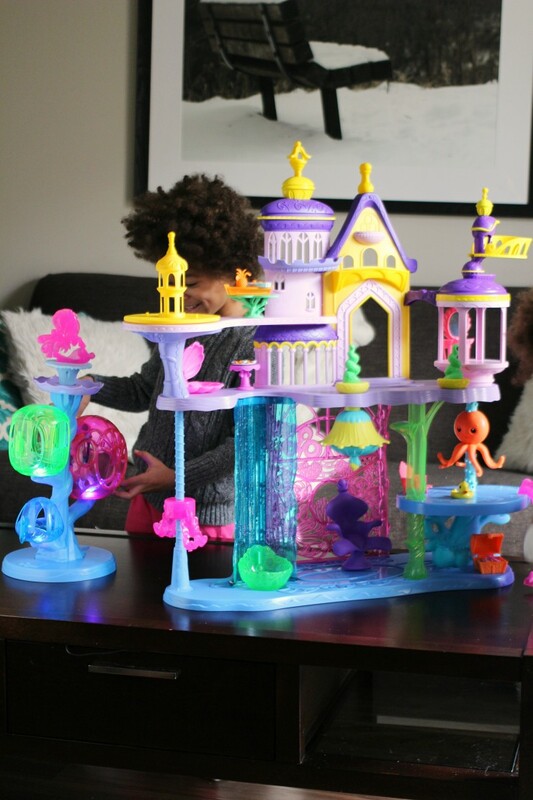 Each part of the castle features fun ways for Queen Novo and Spike the Pufferfish figures to play! Kids can put the figures on the castle’s dance floor and spin it. 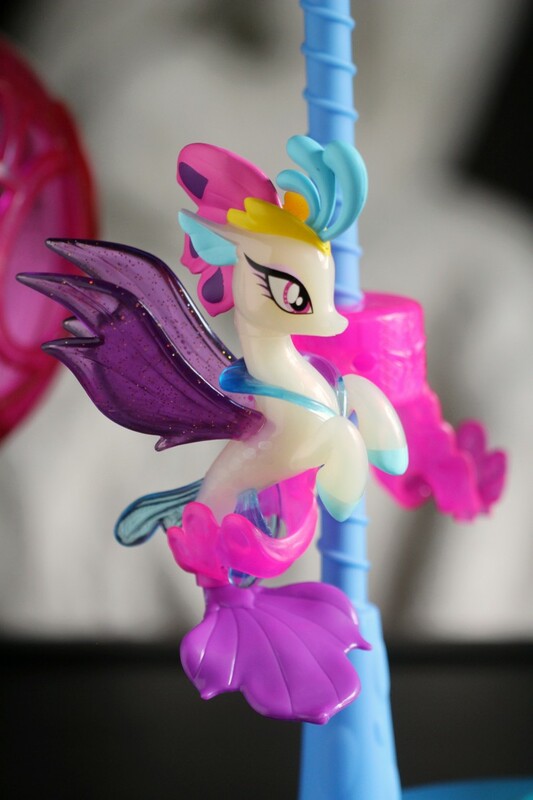 It even has little pegs that regular my little pony figures can be put on so they don’t go flying off when you spin it. 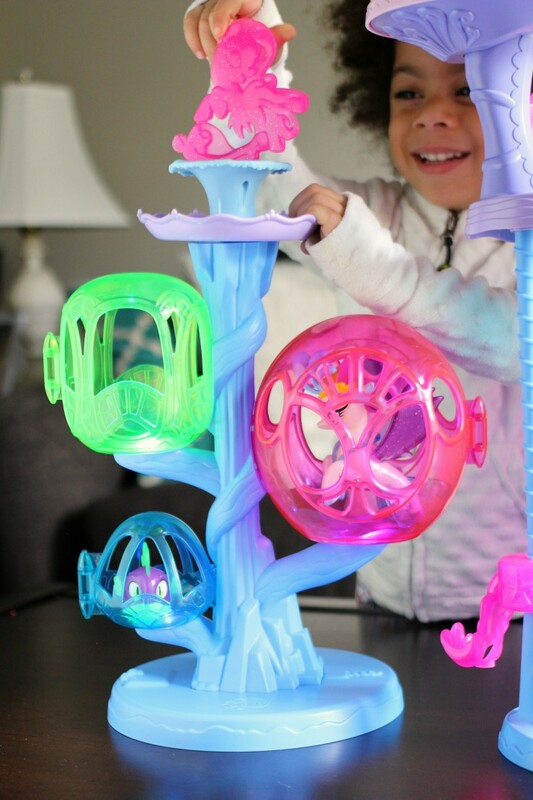 Also included is a tower of three bubble pods that open and light up when you turn the top – perfect for any seapony in need of a beauty rest! 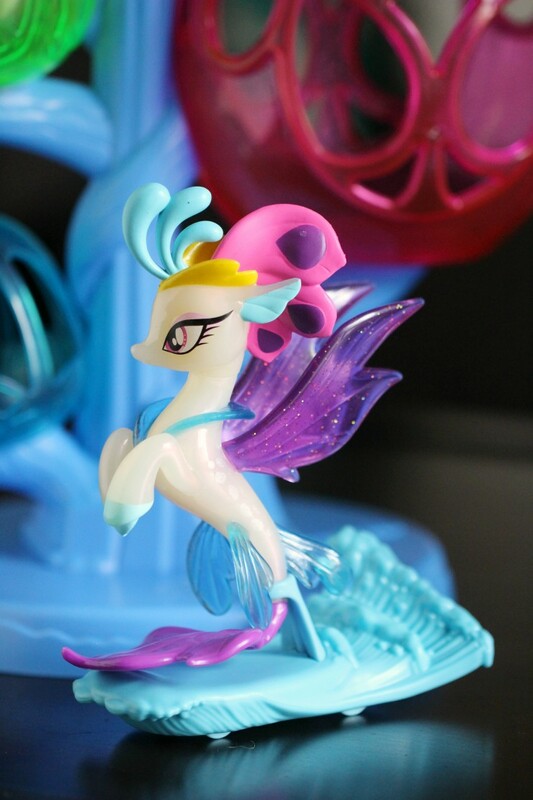 Queen Novo (and other seaponies) can ride up and down on the spinning swing. 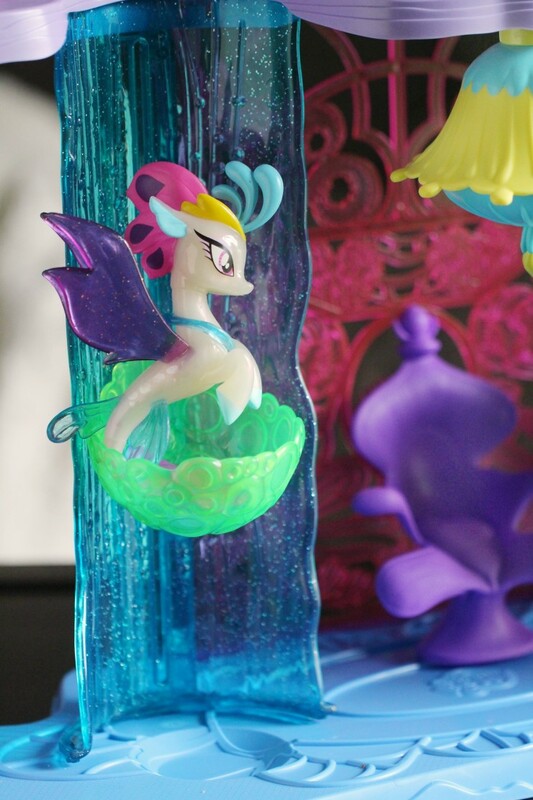 The figures can take a ride in the bubble-shaped elevator from Canterlot down to the kingdom of Seaquestria. 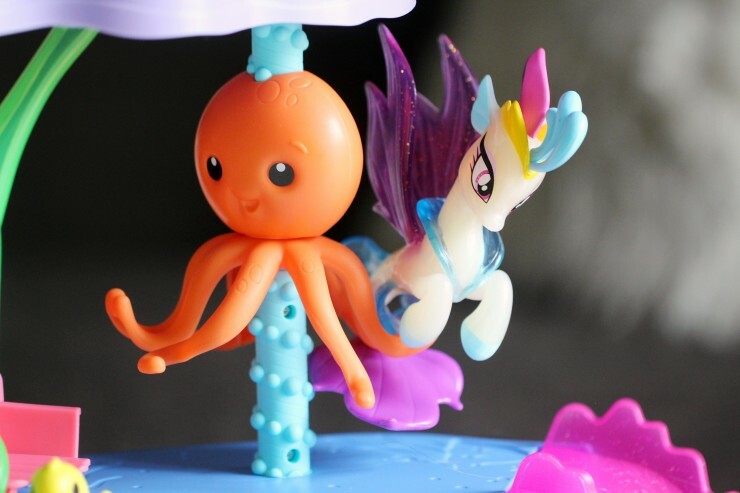 The figures can also fit on Jamal, the spinning octopus ride. 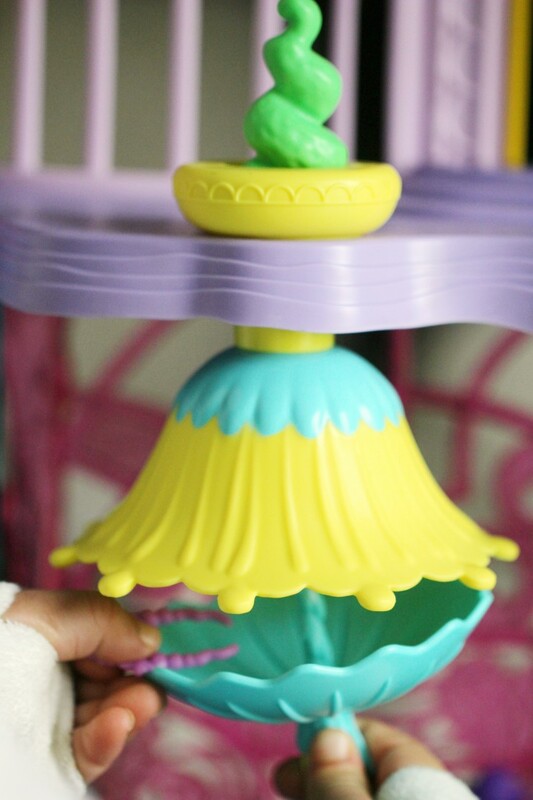 Kids can also push a button to open the chandelier to hide treasure inside. 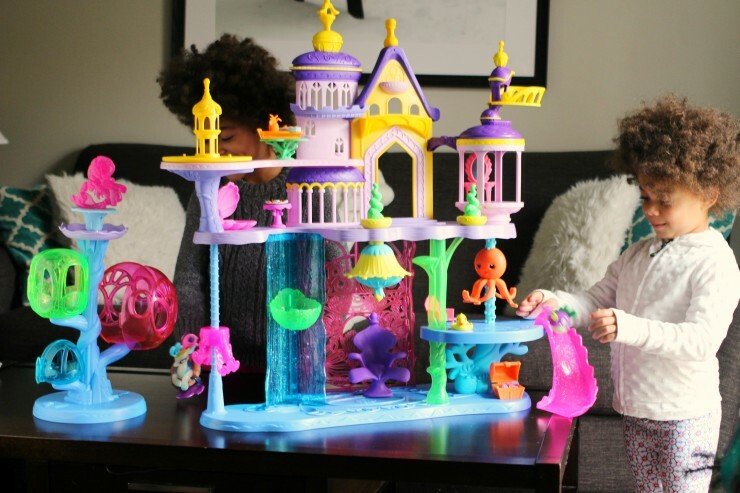 This is such a detailed toy playset and it includes a good number of moving parts that really keep my girls engaged with play. You will need 3 double A batteries for the lights. 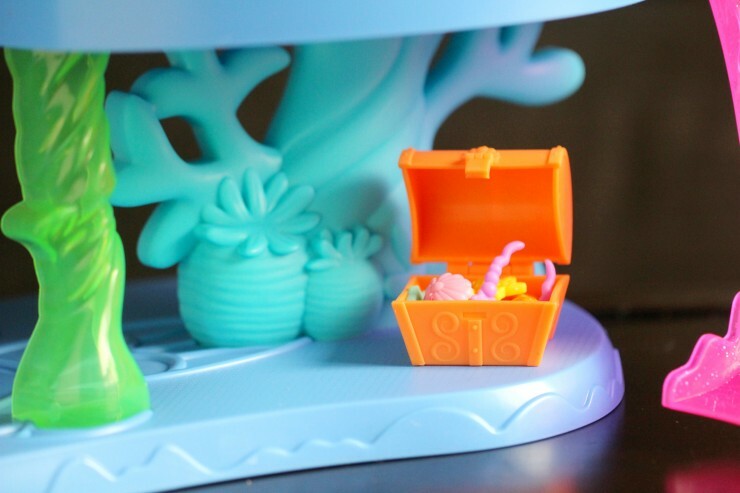 We will definitely be picking up more Seaponies for this playset too, and that is something I’d probably recommend for anyone picking up this playset. Overall this is a really fun castle playset that has seen a lot of use over the past couple weeks and I think it is a toy they will continue to play with over time which I think makes it a winner. Oh my! My granddaughter would have hours of fun with this!! That’s quite the play set, love the size! Oh wow my granddaughter would love this, I like how detailed it is and so much to do! !